Alion Energy Supplies Solar Trackers and Cleaning System for iEnergía’s 3.6MW Calle Larga Project near Santiago de Chile. RICHMOND, CA June 15, 2018 – Alion Energy announces supply of its StormTracker and SPOT robotic cleaning system for iEnergía’s 3.6MW Calle Larga project. 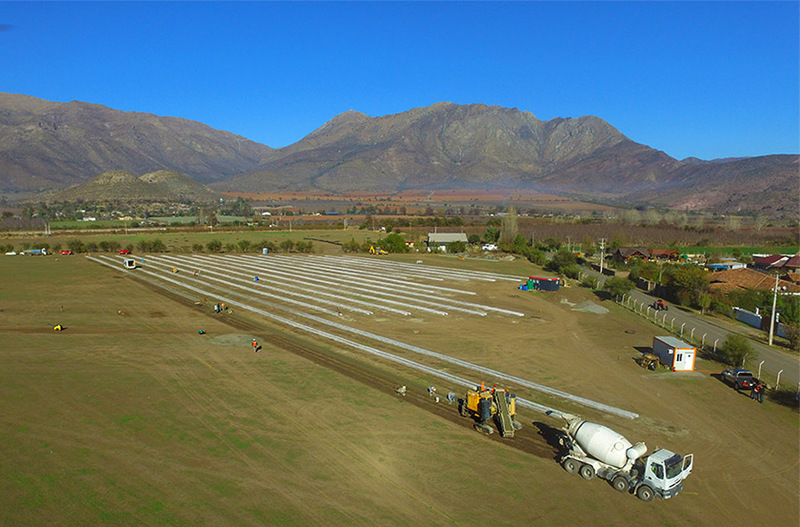 Located approximately 75km north of Santiago, Chile, the project broke ground in the end of May and is expected to reach commercial operation in October. This project represents Alion’s debut of its novel tracker and automated cleaning technologies in South America, following earlier projects in Mexico, USA, and India. Alion Energy’s StormTracker uses a ballasted foundation that simplifies construction and an elegant structural design that squeezes out substantial amounts of steel versus its competitors. Alion’s robotic cleaning system delivers reliable, high-quality cleaning at low cost with a robotic vehicle that uses the concrete foundation as a vehicle track. Based in Richmond, CA, USA, Alion Energy offers its solar tracker and robotic cleaning systems globally to reduce the levelized cost of solar projects, especially for those challenged by difficult ground conditions or panel soiling.